Who were they made for? Just who made The lady and the unicorn remains a mystery – though some questions can be answered. Today it is believed the tapestries are among a group of works originating from the Paris workshop of the Master of Anne of Brittany. 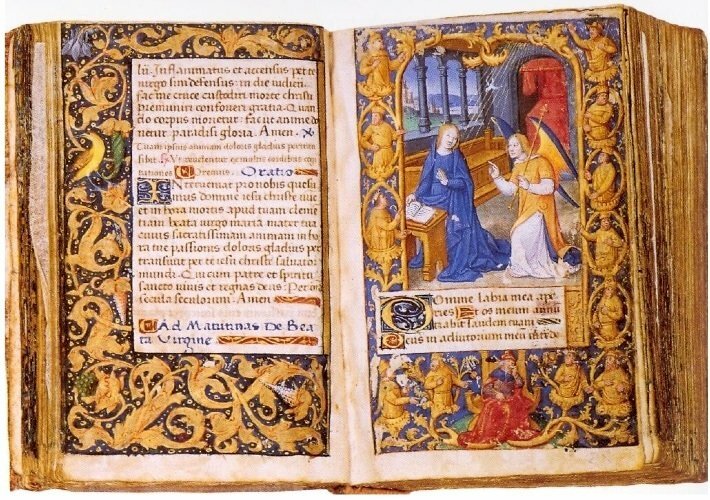 Other than the tapestries, the most famous of the works is the Very small hours of Anne of Brittany, a book of hours – or small devotional prayer book – made for Anne, queen consort of France, around 1498. It is this work that gave the anonymous master his name. Art at this time was changing, it no longer only served a religious purpose, nor was it solely for royalty; the Master of Anne of Brittany was known to have had many patrons among high-ranking officials. Though not definitively identified, the Master of Anne of Brittany was possibly the artist Jean d’Ypres or may have been a collective of artisans, active in Paris from 1480 to 1508. Whoever the Master of Anne of Brittany was, he drew the design for the tapestries that was then woven by master weavers. Workshops such as his produced everything from illuminated manuscripts and engravings to stained-glass windows. The Master of Anne of Brittany would have made the model, or cartoon, for The lady and the unicorn tapestries, which would then have been woven by master weavers. Large tapestry production centres with organised weaving guilds emerged fairly rapidly in the 14th century all around the Low Countries and northern France, with hubs in towns such as Arras, Brussels, Antwerp and Tournai. The lady and the unicorn was most likely woven in the Southern Netherlands, though possibly in France. The weaving of a tapestry took several months or years. It required large sums of money, the making of a model, the purchase of raw materials, weaving and finishing. Tapestries spread in Europe alongside other technical and financial innovations, woven by workshops of weavers, and sold by merchants who had capital and could negotiate with princely, noble or bourgeois sponsors. Tapestries then, just like illuminated manuscripts or the work of goldsmiths, were luxury objects: specially commissioned and woven according to the instructions of an individual or a family for a specific occasion by a designer.